Protecting your site with CryptoPhoto is quick and easy. 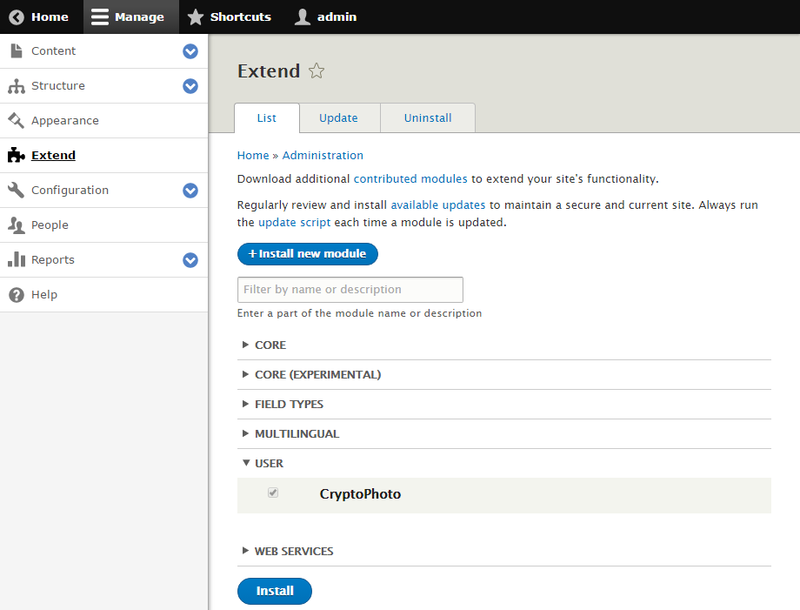 Before being able to deploy the CryptoPhoto Drupal plugin, you must register a new CryptoPhoto administration account and obtain API Keys, which will be used to configure CryptoPhoto for Drupal. Creating and configuring a CryptoPhoto administration account is described here. Download cryptophoto-drupal-8.x-1.1.zip ZIP archive. You will get a Drupal module package. 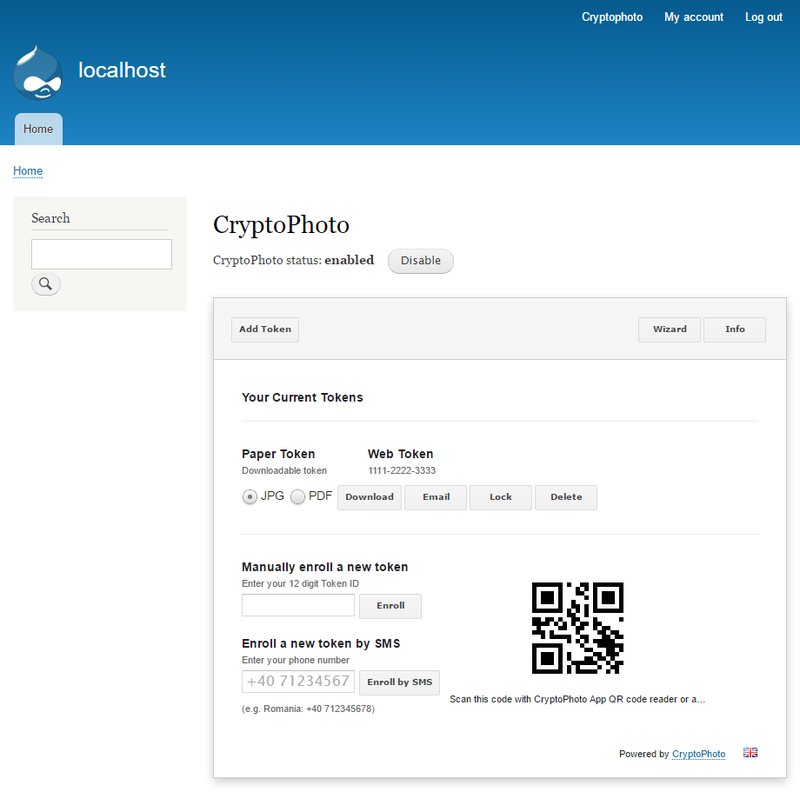 Once installed and enabled, you can start configuring CryptoPhoto for your Drupal site. First we need to set the API Keys that will be used with the CryptoPhoto deployment. You can reach the CryptoPhoto Configuration page by going to Extend, click on Help (expand CryptoPhoto item), then click on CryptoPhoto Settings: "/admin/config/cryptophoto/settings"
Complete the Cryptophoto setup by setting the values of the private and public keys variables to the values of the API keys you received when you created your CryptoPhoto account. Also set the value of the salt*. *Note: The "Salt" is used to create unique user IDs. It is recommended to use a random string. Once set to a certain value, do not to change it, or the CryptoPhoto settings for all the site users will be reset. Note: You can use the Wizard button to start the wizard plugin configuration which will take care of configuring the API keys and salt for you. Use the Test configuration button to verify your configuration. Enable permission for your users to access CryptoPhoto service and "Save". After you've enabled, configured the plugin and permissions, users can activate/deactivate the CryptoPhoto service by accessing the CryptoPhoto through the "My account" menu. From this point on, your users can download/enroll new tokens and opt-in CryptoPhoto Authentication. The CryptoPhoto Settings page will be available for all your Drupal users. To remove the CryptoPhoto plugin, uninstall it using the uninstall option in your Extend page.